AntlerMax feeds with Purina exclusive Climate Guard deer feed supplement encourage deer to feed as the temperature rises. Which helps bucks maximize their potential for antler growth. 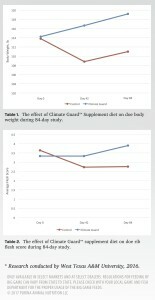 What is Climate Guard™ Supplement? Purina’s exclusive Climate Guard deer feed supplement helps support weight gain and body condition by encouraging feeding during heat stress events. It’s formulated to provide antioxidants to support deer during climatic stress, like hot weather. It’s comprised of high-quality ingredients that support rumen function, gut health and optimal nutrient utilization. It supports digestibility of starch in the small intestine. After 42 and 84 days of treatment, does consuming AntlerMax® Breeder pellets enhanced with Climate Guard™ feed supplements were 10% and 8% heavier than the does consuming the Control diet (Table 1 image). Rib Flesh Scores of does consuming the AntlerMax® Breeder pellets enhanced with Climate Guard™ supplement had 41% greater rib Flesh Scores on day 84 than the does consume the Control diet (Table 2 image). The researchers observed that the does consuming the AntlerMax® Breeder pellets enhanced with Climate Guard™ frequented the feeders more often during the heat of the day than does consuming the Control diet which supported the increased weight gain and Rib Flesh Scores. Nutrition-packed, 20%-protein, pelleted ration designed to support the nutrition of deer in their native habitat. The high protein content supports top performance to support antler development in bucks and reproductive success in does. It is a high-quality nutritional package with ideal amounts and ratios of vitamins and minerals for antler development in your bucks. Good nutrition may also promotes abundant milk production for growing fawns. Keep your deer growing this summer with AntlerMax® deer feeds with Climate Guard™ Supplement and Purina Antler Advantage. 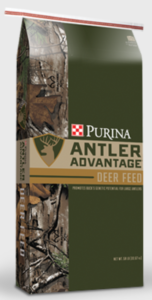 Shop Argyle Feed Store for Purina Climate Guard Supplements and AntlerMax deer feed and Purina Antler Advantage and save $2 Off per bag. This entry was posted on Wednesday, June 14th, 2017 at 12:47 am	and is filed under News & Updates, Specials, Wildlife, Deer. You can follow any responses to this entry through the RSS 2.0 feed. You can skip to the end and leave a response. Pinging is currently not allowed.